The City of Fremantle encourages diversity and is committed to creating an accessible, inclusive and welcoming community for people of all ages and abilities. We are committed to making continual improvements to ensure that buildings, facilities, services, events, information and employment opportunities are available to all community members – including people with disability. The City of Fremantle's 2016-2020 Access and Inclusion Plan outlines a strategic approach to improve access and inclusion for people with disability over the next five years. The actions of this plan will also benefit seniors, people with temporary injuries and parents with young children in prams. 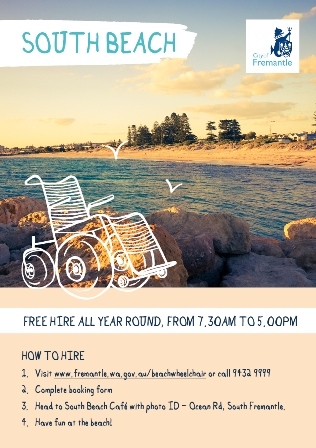 The City has two beach wheelchairs available for free hire throughout the year – one at South Beach, South Fremantle and one at Bathers Beach. Both wheelchairs can currently be booked in advance or at the time if it is available for use. Use the online booking form or download the print version to complete and mail or email to the City. 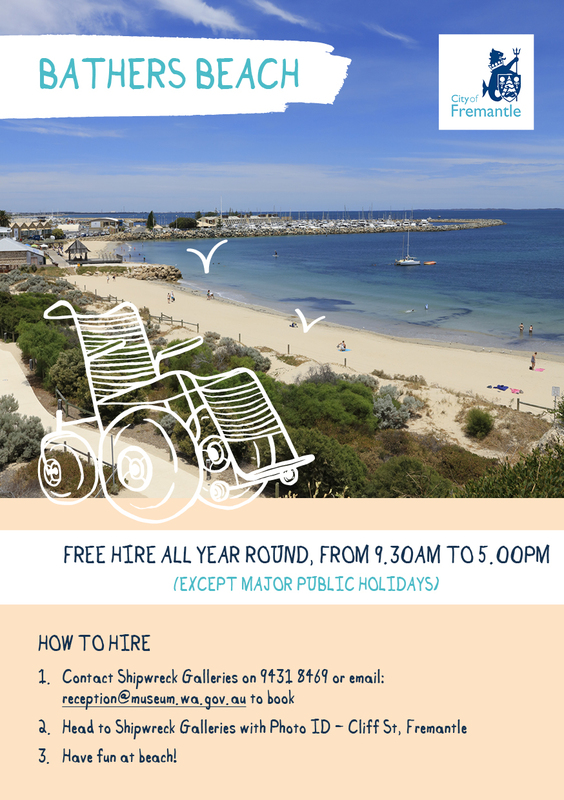 Head to South Beach Café with photo ID to collect the keys for the wheelchair – Ocean Rd, South Fremantle. To book contact WA Shipwrecks Museum on 1300134081 or email reception@museum.wa.gov.au. Head to WA Shipwrecks Museum with photo ID to collect the keys and wheelchair – Cliff Street, Fremantle.